The Overlook Theatre: The Soska Sisters and "See No Evil 2"
The Overlook Theatre is a bay area community of characters who gather to screen, discuss, and review film, with a strong emphasis on horror. 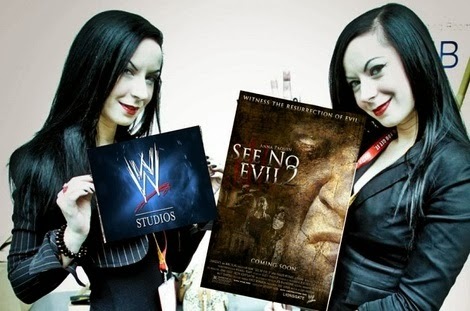 The Soska Sisters and "See No Evil 2"
The Twins have been busy getting "See No Evil 2" ready to shoot. I haven't been covering their progress much since they have really only announced the casting since my last post. And although most of the names are not that exciting, a couple totally add to the anticipation. First Katharine Isabelle (Ginger Snaps, Freddy Vs Jason, American Mary) will be joining the twins again adding to her growing list of horror film roles, Second is Danielle Harris (Halloween 4-5, Hatchet 2-3, etc...) who is horror royalty and totally an awesome grab, defiantly a direction WWE wouldn't have gone in without some outside influence. As excited as I may sound about the casting it sadly was not the reason I felt the desire to write this post. The inspiration came from an interview I read on Craveonline. WWE and pro wrestling in general has always been pretty over the top, creating larger than life characters and then parading them down a thin line between reality and fantasy. Nightly they blur the line between sport and "entertainment", presenting super campy soap opera story lines filled with laughs and gags. Little does the audience know that the villain who recently slept with the hero's wife to cause his marriage to crumble just in time to take his mind off of their PPV title fight, really did so and it has been going on for years. The divorce and drama is all real and this makes the story THAT much better for TV, this particular indecent happened not to long ago with Kurt Angle and Jeff Jarrett. Ultimately I love cheering for larger than life characters (Which also helps explain my love for slashers, Go LeatherFace!) and that means I love wrestling. Now imagine how happy I was when I realized that WWE had partnered up with Lion's Gate again and hired a new polarizing couple of directors, then I read this interview that made me understand how wholly the twins embarrassed the line blurring of the WWE. You will have to read the interview to understand what I'm talking about but it really seems like the marketing and full understanding of the materialism of horror fans means they will be doing this right. Talking about reality and fantasy being blurred in wrestling has totally derailed my focus, so checkout the interview here and let me know what you think. I can't wait to see how they make Jacob Goodnight a slasher that people want to celebrate rather than just forget. Anything submitted will receive a full viewing and honest review. The Overlook Hour (Podcast) with Clark Little, KillDozer, and Lord Battle! Every Thursday! Angels of Death; Is Zack Alive or Dead? Amazon Prime Hates Your Horror Movie. Double F'n Feature Thursday the 12th!